After taking the box out of the clamps, I loaded it up with tools to check capacity and weight: 55 lbs. without lid. So not a total gutbuster, but not light either. At least I can move it in and out of my van by myself and put it on a dolly. Plenty of room for stuff! Not that I'd want to carry chisels and things loose like this. The next step was to make the lid. I wanted a raised panel inside a frame lip (not a flat frame). Glue up for the top panel. Pinch dogs hold the joint well; you can see the glue squeeze out from the pressure. 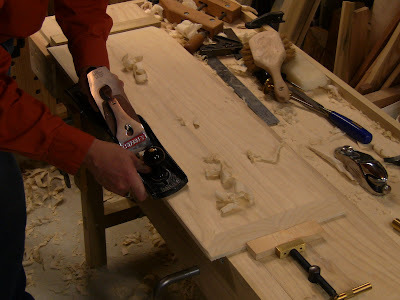 Just make sure you leave enough rough length to saw off the end holes after it's dry. Ripping the stock for the top frame; after ripping the thick stock for my portable workbench, this thin stuff is child's play, about 30 seconds to rip down the 6-foot length. Then I cut the pieces to rough length, jointed them, shot the ends, formed a frame one dovetail high, and grooved it for the panel. 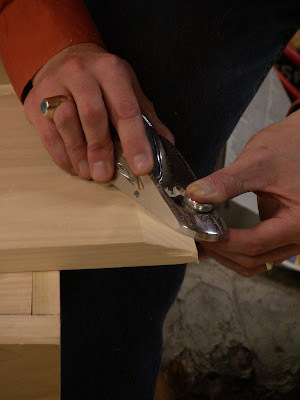 Raising the panel: across the grain with a badger plane. I got the iron razor sharp, but the sole needs work, so this is a bit rough to handle. Still, the skewed iron takes a satisfying end-shaving, like a giant pencil sharpener. 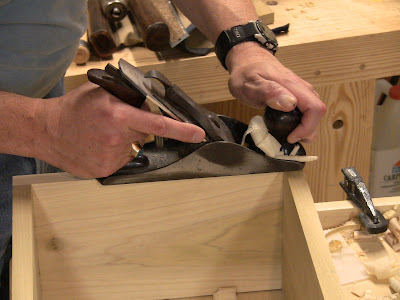 Fine cleanup with a block plane. Note the tearout at the edge: this is the reason for doing the end grain first. This was even after having chamfered the edge. Raising the side using a #6 with a new Pinnacle blade. Nice fine cut. It's awkward planing left-handed (naturally, the grain ran the wrong direction), but I just concentrated on fundamental form holding it. 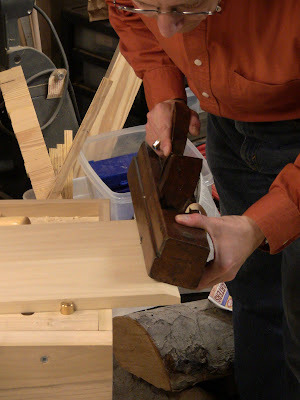 Fine tuning the width with a block plane after test fitting in the frame. 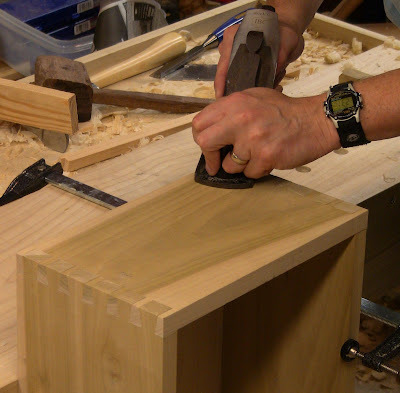 Test fitting the completed lid before glue-up. 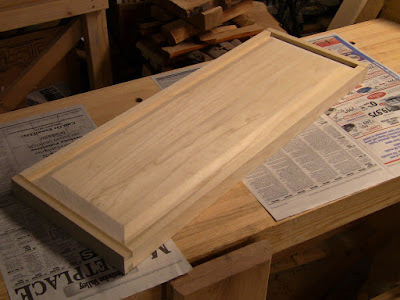 The panel floats free in the groove, which means the side of the lid will probably bow a bit. We'll see how that design plays out over time. At this point the box was structurally complete. However, the dovetails were what I call "10-foot dovetails," meaning they only look good from a distance of 10 feet or more. 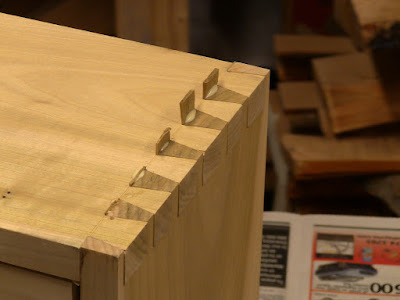 I crosscut a piece of scrap and chiseled off tiny wedges to fill the worst spots and at least turn them into 2-foot dovetails. Wedges fitted into the gaps where I screwed up the baseline. Cleaning up using a #4 smoother with another Pinnacle blade. The good replacement blade instantly showed that the sole needed work, so I gave the bottom a good lapping on sandpaper on glass to 320 grit, getting it satiny smooth. Now it takes a fine smooth shaving. 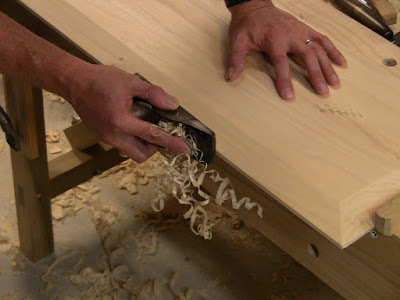 This plane has enough mass to cleanly cut the dovetail end-grain, followed by a swooping lift-off motion at the end. Leveling the joints. A well-tuned smoother means you can fit it with great precision. After this, it was just a matter of hardware installation. I couldn't find heavy-duty handles in brass finish. 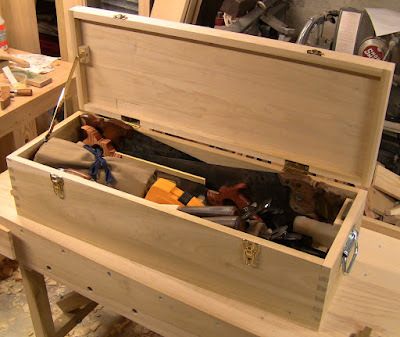 The completed box with just the tools from my minimum list. You could build just about anything with this load. Closed up for travel. Total weight: 62 lbs. What's in your toolbox? A bit crowded, but everything's sufficiently secure. I screwed small cleats to the bottom to keep the planes from sliding around. 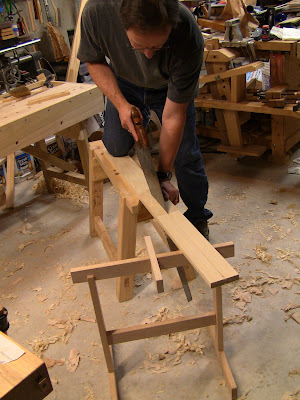 The saws sit in kerfed blocks glued to the bottom. The machinist's square is safely nestled in a fitted hanger on the right end. The two pig-sticker mortise chisels are in wooden holsters made by chiseling mating recesses in two halves and gluing them together, the method for making a Japanese saw handle. The roll holds other chisels, screwdrivers, marking gauge, bevel gauge, awl, and marking knife. Another roll holds auger bits and countersink bit. I tried to get a full set of sharpening stones in as well, but between weight and space, just couldn't make it. It's full of little mistakes and imperfections, but it's sturdy and functional. If I paint it, I'll probably use Mike Dunbar's two-color milk paint method; I like the weathered look that produces. 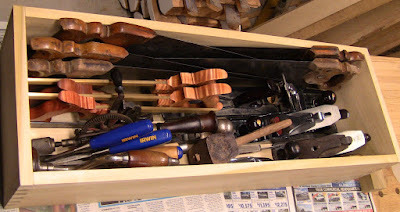 It'll do the job of protecting my tools until I can refine my skills and build a showcase chest (maybe in 10 years). Now I just need to build a few more to carry the additional tools beyond the minimum set, as well as duplicates to equip several students. A fine job you've done there. I worry a little that the tools (esp. those chisels) will move around too much while moving the box. Thanks for sharing, appreciate it.. Thanks! 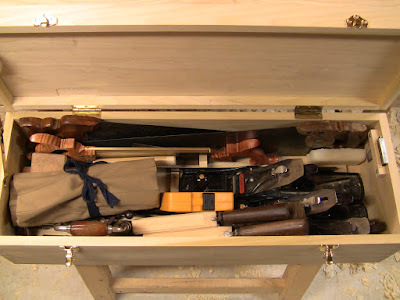 I have all the loose rolly things like chisels in the tool roll for now. After I use it a bit and think about how things fit, I'll put in some dividers. I already spent nearly an hour putting things in and shifting them around trying to get some kind of optimal fit. There's just too much stuff and too many odd shapes, though. Very nice! Much more elegant (and appears easier to carry) than my recent solution: http://luv2sharpen.blogspot.com/2010/09/toolbox.html , though I am happy with the organization that the drawer offers. I'm mentally designing a similar box with two layers of drawer in the bottom. One for odds and ends, and the other for auger bits and chisels, etc. My toolbox also weighs between 50 and 70 pounds, depending on the loadout. Thanks! I've seen that lid support called a "support hinge". It's basically like your arm, with elbow in the middle. The other common style is a curved sliding support. This one seemed a little simpler. 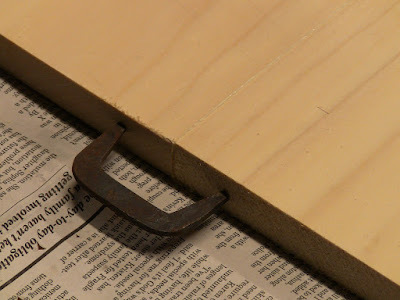 They're all fairly easy to install, but you have to be careful about alignment both open and closed, or it will bind. 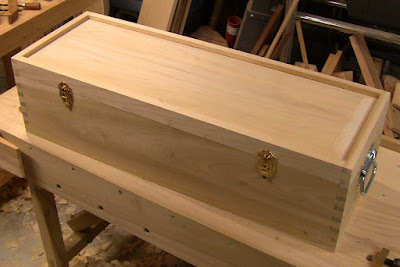 The next box I build will be shorter, so I'll have one for long items like saws, and one for short items. It's just too heavy to try and fit everything in one box. Splitting things up into two or three seems to make more sense. The total weight is higher, but each one is more manageable when you're lugging them up and down stairs and in and out of vehicles. newest twitter updatеs. I've been looking for a plug-in like this for quite some time and was hoping maybe you would have some experience with something like this. Please let me know if you run into anything. I truly enjoy reading your blog and I look forward to your new updates.